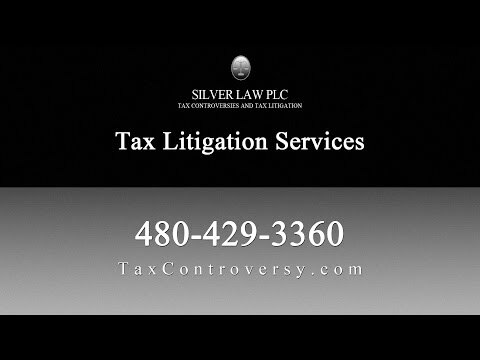 How Silver Law Can Help Represent You in Phoenix Criminal and Civil Tax Litigation! The attorneys at Silver Law PLC can review your case and help you understand your legal rights. Whether you own a business or you only have your personal finances to manage, an audit isn’t something that anyone wants to get. A lot of people just want to pay the amount owed and move on as quickly as possible, before the situation gets any worse. But audits aren’t always accurate, and the IRS may say that you owe money that you aren’t legally obligated to pay. The attorneys at Silver Law PLC can review your case and help you understand your legal rights. In some cases, our Phoenix tax attorneys may be able to find applications of the law that minimize your financial obligation, helping to reduce your penalties, as well. In other cases, our attorneys may be able to mount a defense that challenges the validity of certain laws or policies, helping to create a new legal precedent that will protect you and other taxpayers in the future. Our tax attorneys handle both criminal and civil tax litigation, dealing with matters ranging from simple audits to criminal charges of tax evasion. We work with individuals and companies both large and small. Whether you own a corner shop with just a couple of employees or you own a Fortune 500 company, we can help you. Our tax lawyers represent clients at the local, state and federal levels, as well as in tax court, claims courts and federal district courts. We also handle appeals of previous cases or judgments. Silver Law PLC has represented thousands of clients on a wide variety of tax matters, and we have a record of success for winning favorable outcomes for many of our clients. A tax lawyer with Silver Law PLC may be able to help you reduce your tax obligation, avoid penalties, avoid jail time, or even have the charges against you dismissed altogether. A tax lawyer will meet with you to discuss the details of your case and help you understand your legal rights and responsibilities. At that time, your lawyer will let you know what strategies may be possible in defending you and what the potential outcomes may be. Our firm will explore all possible legal defenses to try to get the best outcome for your case. You have too much at stake to leave your case in the hands of inexperienced or unqualified attorneys or other tax professionals. As an individual, you could lose your home and other assets, or you could wind up with a criminal record. As a business owner, you could lose everything that you have worked so hard to build, and your business name can be raked through the coals in the press. By working with Silver Law PLC, you will get the experienced representation you need from a tax lawyer who is an expert in the field and who has experience representing of clients just like you. Call Silver Law PLC today to learn more about how we can help you and to start taking the steps to protect your financial future.